Patients' physiological function, blood pressure and self-reported pain scores were measured before and after hearing a live, 10-minute harp performance. A new study at The University of Arizona Medical Center is measuring the effects of music on patients in the intensive care unit. In June, 100 patients in the ICU at The University of Arizona Medical Center-University Campus participated in a study on the possible healing properties of music, specifically harp music. Renowned harpist Carrol McLaughlin, a professor in the UA School of Music for 33 years, teamed up with Dr. Ann Marie Chiasson from the Arizona Center for Integrative Medicine and Anne Baldwin, a research professor of physiology, to conduct the study. Out of the 100 patients participating in the study, mostly middle aged or elderly, 50 received a private 10-minute live harp performance on the floor of the intensive care unit. The other 50 functioned as control patients, who simply spent 10 minutes relaxing, without harp music. Baldwin, who was responsible for measuring the patient’s physiological function, blood pressure and self-reported pain scores before and after the harp was played, began noticing blood pressure levels adjusting. “If a patient’s blood pressure was low, which is most of the patients we see here, it increased after the harp music. And for a few with high blood pressure, it’s gone down after. It appears the harp music is bringing this back into balance, back into the normal range, which is ideal for healing,” she said. Of course the study is not suggesting that intensive care patients could be healed with harp music alone. Baldwin said harp music’s potential healing ability is something to be considered in addition to medical intervention. McLaughlin’s music may be beneficial to staff too, said Angela Muzzy, clinical nurse specialist in The University of Arizona Medical Center’s ICU. 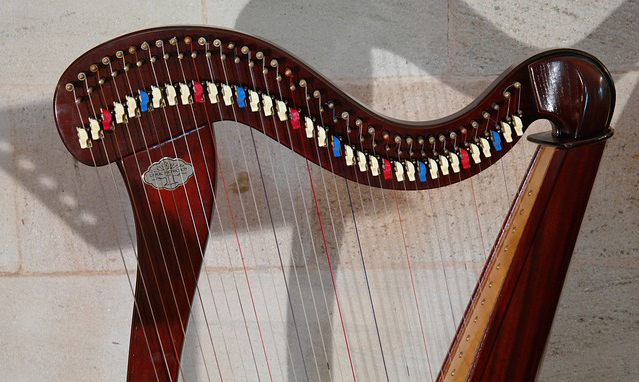 Tucson resident Karen Lytle, who has experienced the balancing effects of McLaughlin’s harp music herself, felt so strongly about the subject she agreed to fund the study, as well as go through research assistant training so she could aid in the study. Lytle said the response she witnessed from study participants was overwhelmingly positive. Regarding the actual role music played in altering the patient’s system, McLaughlin says she adjusted the key in which she played for each patient.